A vanishing edge pool adds a breath taking aesthetic element that you can’t find from any other pool. You’ve finally decided to get a pool installed into your yard, but you want to add a little something extra. A vanishing edge pool is a great swimming pool design for your backyard because it is both beautiful and practical. You might have seen these pools at a fancy resort and never thought it was something you could own yourself, but it is becoming a very popular choice for homeowners. 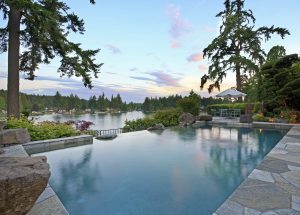 Commonly referred to as an infinity pool, here are some benefits of a vanishing edge pool. Any type of pool will have some appeal to your backyard, but not like a vanishing edge pool. This swimming pool design transforms your backyard into a luxury spa area. These pools give off the illusion that the edge of the pool is pouring over onto the horizon. It gives your pool a beautiful, serene look that is sure to give your yard a drastic aesthetic boost. It is great for areas that are located on a hill or are by the water to enhance an already nice view. Even if you aren’t in the mood to swim, you could just pull up a chair and watch the beauty of water falling into the sunset. Unlike regular pool pumps, pumps for a vanishing edge pool only need to be running while the pool is in use. This saves the amount of water used in the long run. Also, because the water is constantly moving and being recycled, it is helping the environment while keeping maintenance low. This type of pool essentially filters itself which is great when it comes to cleaning needs. A lot of people are concerned that children will fall over the edge with a vanishing edge pool. However, it is actually very easy to customize your swimming pool design and create designated areas for children. You can shape the water differently so that certain areas are significantly more shallow than others. In addition, it is required that alarms and barriers are implemented into a vanishing edge pool in order to ensure its safety. Ready For Your Vanishing Edge Pool? Contact Paradise Pools Today! This entry was posted on Friday, December 22nd, 2017 at 1:25 pm. Both comments and pings are currently closed.